July 1st marks the one year birthday of my NanaBread blog. Can you believe it? Neither can I. While time seemed to fly by, it feels like we packed a lot into this first year. Favorite recipes, photos of the family, Ziggy’s adventures in… well, snoring. We even started highlighting some of the culinary creations of The Complete Package, my beloved husband. We’ve also seen the grandkids grow at an alarming rate, shared Hoegarden stories about our “ladies only” family weekends, thrown in a few crafts, and shared some of our travel pics. We’ve highlighted local products, spotlighted some of our favorite barbecue joints, and sprinkled in some of the things I love. I think this first year definitely lived up to my blog header in that it truly is a lot like my junk drawers. It’s happily filled with random tidbits, trash and treasures. Mission accomplished. Overall, it has been a great year, and I couldn’t have done it without you. In fact, you are the reason I’m still here. Your comments and support are what keep this blog (and me) going, and for that I thank you from the bottom of my heart. I really do. I appreciate each visitor and value every comment, but those of you who return again and again are more than readers, you’re friends. And that is the gift I most value from my first year of blogging. You. Without you and my family, there would be no Inside NanaBread’s Head. I keep writing because you keep reading. I don’t always understand why, but I’m so happy that you do! Here is a look back at a few of my favorite posts. Click on any title to see the full post and take a walk down memory lane. My name is NanaBread and I’m a Peppermint Bath Product Junkie. This post still makes me laugh. I was suffering from a particularly raging hot flash when I sat down and let it rip. I don’t rage often, but I let it fly with this one. I felt like life had lied to me by omission, and I didn’t want another woman to be taken by surprise ever again. This one was for the ladies, especially those in the inescapable grip of “the change” like me. It also confirmed for me that if menopause had a rubber wristband, it should be black like my mood swings. Of all the recipes I’ve posted, this is the one I personally enjoyed the most. I’ve never had an experimental recipe come out of the oven and make my eyes roll back in my head like this one did. Deep down in my soul, I’m a pie girl. But these cupcakes almost converted me. Dark chocolate, coffee and peanut butter? Seriously – it is probably the closest I’ll ever come to cupcake perfection. Speaking of cupcakes, the prettiest cupcakes of the year (by far) were my Big Sister’s rainbow tie-dyed beauties. These were inspired by a food blogger I love, but Big Sis put her own spin on it by using one of our mother’s old white cake recipes and a frosting recipe she found on the Tasty Kitchen website. She brought all those elements together to make not only a gorgeous cupcake, but a tasty one. The great thing about this recipe is that it’s adaptable. You can substitute any white cake recipe or mix, and you could use any frosting recipe. But honestly, the one Big Sis found was awesome. For pure fun and beauty, these rocked my world and made me think outside the (cake) box. Vacation Photos of Amsterdam: Let’s just say it was…interesting. Of all the stories I’ve shared, this one continues to get regular weekly hits months after it was posted. Evidently, Amsterdam is a highly searched travel topic. Who knew? Maybe it’s the cheese; maybe it’s the weed; maybe it’s the waffles. It truly is a “whatever floats your boat” city. It was a great trip and an interesting place, and months after it was posted this story is still going strong. This post will always be special to me because it was the first time one of my stories was selected as a FoodPress feature. It got attention from around the world, which seemed to open my blog up to an expanded global view. I received comments from exotic locales, and gained a few subscribers from far away places who visited and decided to stick around. For that, I am eternally grateful. It left me wondering if good BBQ might be one of the keys to world peace. This was by far my most read post of the year thanks to a feature on the WordPress “Freshly Pressed” homepage. I don’t know how they select stories to feature, but I was blown away that this one garnered their attention. It was highlighted on the Friday before Mother’s Day and left up the entire weekend. Because of that, it got over 8,000 hits in 3 days. Some bloggers hope that their blogs will hit the big time, but in all honesty this one made me a nervous wreck. That kind of attention brought a lot of spam and more than a little anxiety, but it also provided an opportunity for others from around the world to share memories of their mothers and siblings, or lack thereof. It was both an emotional and enlightening experience for me. It also provided my mother with more than 15 minutes of fame, which was fun for her. She deserved it. THIS GIVEAWAY IS NOW CLOSED TO COMMENTS. THE WINNER OF THE DRAWING HAS BEEN NOTIFIED BY E-MAIL, AND WILL BE POSTED AS SOON AS I HAVE A CONFIRMED MAILING ADDRESS. THANKS TO ALL WHO PARTICIPATED. 2. The selected reader will be notified by e-mail. Once I have a confirmed mailing address, I will announce the recipient of the gift box on my blog. 3. Participation is limited to residents of the United States. 4. One name will be randomly selected on Friday, July 8th at Noon (Central). Disclaimer: All gift box items were purchased by me with my own money except for the apron, which was handmade by me. None of the products were donated or sponsored in any way, shape or form. They are simply items that I love, shared with one lucky reader. Again, thank you from the bottom of my heart for being a reader of my blog. Your support and friendship over the past 12 months has meant the world to me, and I look forward to seeing what the next year will bring. Summer reminds me of fresh fruit – strawberries, blueberries, watermelon and peaches – and hot summer weather reminds me of my mother’s raw peach pie. It’s what I call a “freestyle” recipe. She made it every summer when peaches came in season. It’s a family favorite and a perfect summer treat because it’s easy, light, refreshing and delicious. Mom always made hers with pie crust, but for the sake of shortcake lovers, I’m giving you TWO versions to choose from. One is made with cinnamon sugar pie crust and one is made with brown sugar biscuits. I have a personal favorite, but I’ll let you decide which one sounds best. 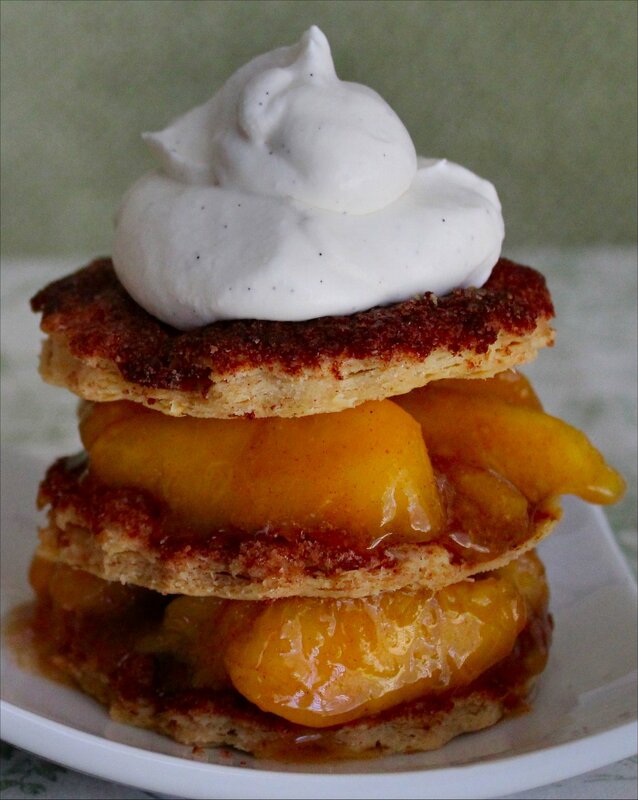 To prep your raw peach pies, begin by peeling and slicing your peaches. Sample a few slices to determine how sweet your peaches really are. If they need it, add a few tablespoons of sugar, give them a good stir, and place them in the refrigerator to macerate for at least one hour. If you don’t need extra sugar on your peaches, e-mail me immediately and let me know where you’re buying yours. Our peaches smell fabulous, but they’re not very sweet. The next step is deciding which crust appeals to you – are you a biscuit guy/gal or a pie crust person? If you’re making pie crust, simply use your favorite recipe, roll the dough into a rectangle and place it on a baking sheet. Brush the pie dough with melted butter and sprinkle generously with cinnamon sugar. Bake at 425F until the crust turns a beautiful shade of light brown, as if you’re baking a pie. Remove from the oven and allow the pie crust to cool to slightly warm or even room temperature. Can you cheat and use that store-bought brand that comes in a box and rolls out? Absolutely! Who’s going to know except you? If you are a biscuit lover, grab your favorite biscuit mix. I prefer Pioneer Buttermilk Baking Mix, but if you are a loyal Bisquick user, that works, too. Depending on how many people you’re serving, measure the biscuit mix into a bowl. Add 2 tablespoons of brown sugar for extra flavor (this is dessert, after all), stirring to combine it with the biscuit mix. Then add enough milk or buttermilk to form a nice biscuit dough. Place it on a floured surface and roll it to approximately 3/4″ thick. Cut into round biscuits, placing them on a baking sheet. Brush the tops with melted butter and sprinkle generously with cinnamon sugar. Bake at 425F until they are fluffy and light brown. Remove from the oven and allow them to cool to slightly warm or even room temperature. While your pie crust or biscuits are baking, beat up a batch of homemade whipping cream. I like to use one pint of really cold heavy cream, 1/4 cup of granulated sugar and 1/2 teaspoon of vanilla bean paste. You can use vanilla extract. It works just as well, but I love those vanilla bean flavor flecks you get with vanilla bean paste, so if you can find it, use it. You’re worth it. To assemble, grab a serving bowl or plate and begin with a layer of pie crust or biscuit. If you’re using biscuits, I like to split them in half. If you’re using pie crust, just grab your slab of cinnamon sugar crust and break it into serving dish size pieces. 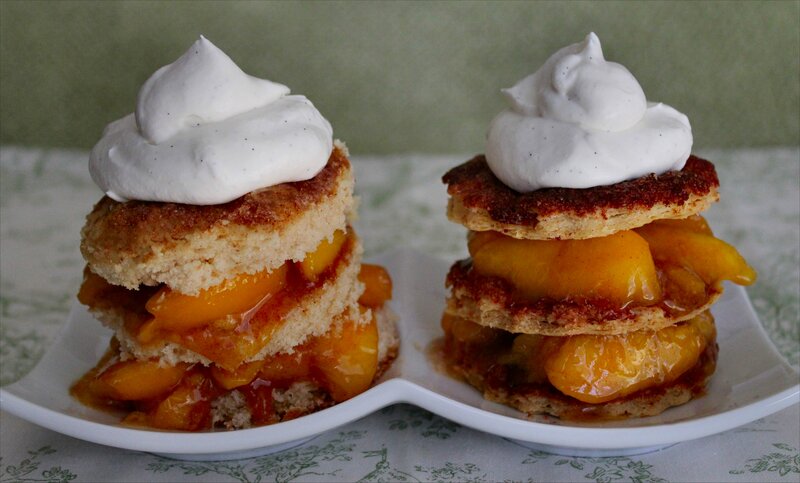 Top your crust of choice with a big spoonful of sweet peaches and a dollop of whipping cream, then create another layer. You can stack them as high as you like; the sky and gravity are the limits. Or you can just pile cut biscuits or pie crust into the bottom of a bowl and top it with peaches if presentation is not high on your priority list. It’s your bowl; do whatcha’ wanna do. Now for the big flourish – top with a generous blob of whipped cream and you’re done. Grab a spoon and a glass of ice tea and enjoy the best summer and my Momma has to offer. Thanks, Mom.